These hearty and flavorful beans make a fabulous side dish to serve with barbecue or take them along to a party or potluck in the slow cooker. 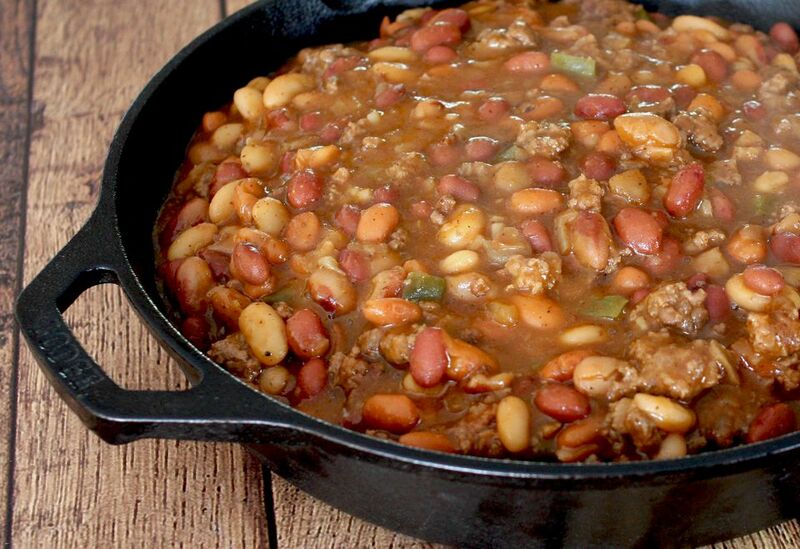 I always serve this or a similar bean dish with pulled pork or pulled chicken. The canned baked beans are an important component of this dish, because of the flavor they add, but you can change up the other types of canned beans. See the tips for some substitution ideas. These beans can be a side dish as well. Add more beef for a heartier dinner dish and serve them with coleslaw and hot baked cornbread or biscuits. In a large skillet over medium-low heat, cook the bacon until just crisp. * You can either cook the bacon whole or cut the bacon into chunks before cooking. Once crisp, remove the bacon to paper towels to drain. Leave about 2 teaspoons of bacon drippings in the skillet and discard the remaining drippings. Place the skillet back over medium heat and add the ground beef and chopped onions. Cook, stirring and breaking up larger chunks until the beef is no longer pink. With a slotted spoon or spatula, transfer the ground beef to the crockery insert of the slow cooker. Add the brown sugar, dry mustard, the pork and beans, the two cans of drained beans, the ketchup or barbecue sauce, and vinegar. Taste and season with kosher salt and freshly ground black pepper. Cover and cook on LOW for 3 to 5 hours. There are two great ways to cook bacon, baked or fried. For baked bacon, heat the oven to 375 F. Line a rimmed baking sheet with foil. Arrange the bacon in the pan and bake for 22 to 26 minutes, or until crisp. For fried bacon, lay the bacon strips in a pan and place over medium-low heat. When you notice the bacon is curling slightly, turn it over. Continue cooking, turning occasionally, until browned. Depending on the amount of bacon you are cooking, you might have to fry it in batches. Remove the bacon to paper towels to drain. If you have baked beans but you don't have kidney beans or lima beans in your pantry, use pinto beans, great northern beans, black beans, or navy beans. Even canned black-eyed peas would work in this dish! Use part ground pork or sausage along with the ground beef. Add 1/2 cup of diced green bell pepper or a combination of red and green bell peppers to the skillet with the onions and ground beef. Easiest Ever Slow Cooker Baked Beans and Bacon - 5 Ingredients!